Stalwart blog readers will remember our bumper crops of former years. There have been lots of tomatoes (see here), peaches (see here), and last fall we were drowning in colossal butternut squash (see here). 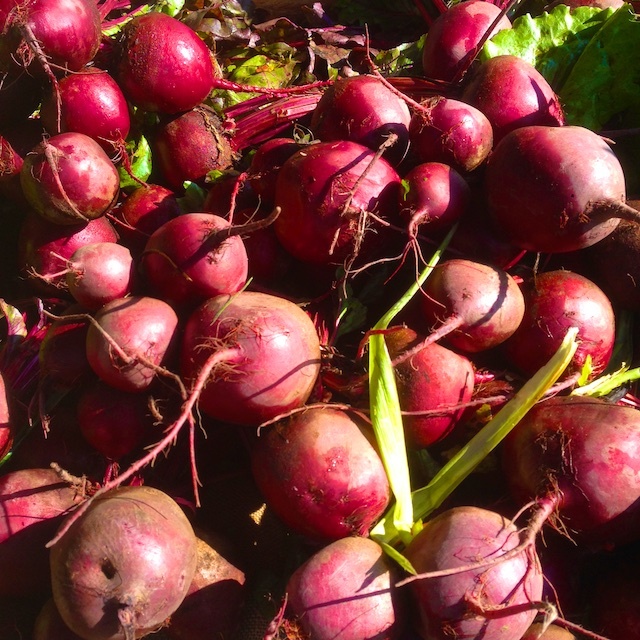 Well, this year, folks, it is beets. Lots of them!! 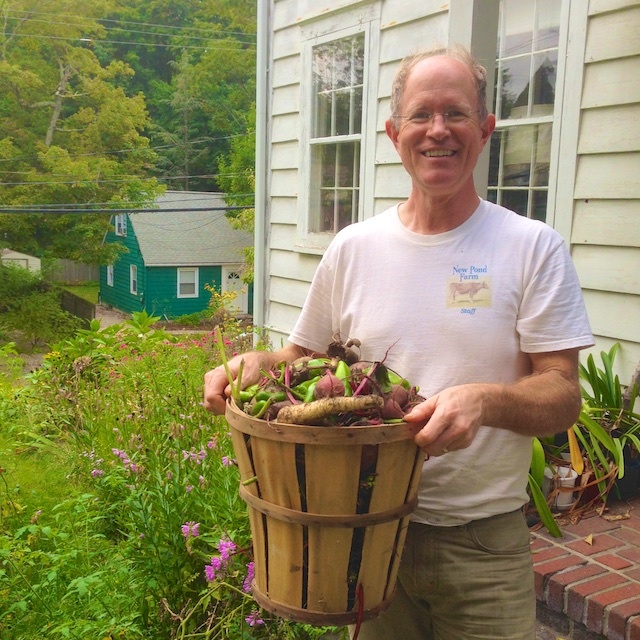 Hence, I recently had a post on making beet greens, and many of you asked what I do with the beets. The answer is that I roast them, and longer than most people do. Before I did this, I didn’t even like them. 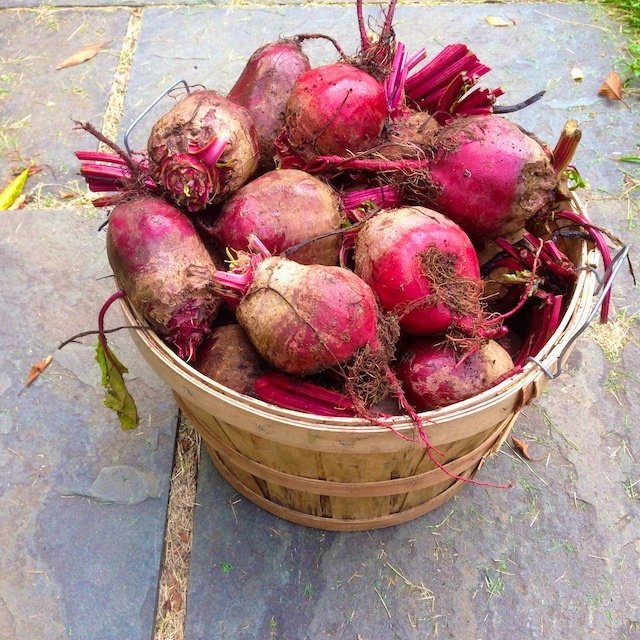 Others, now, who don’t think they like beets, politely try mine, and revise their whole opinion of this vegetable. Roasting them long renders them dreamily delicious. 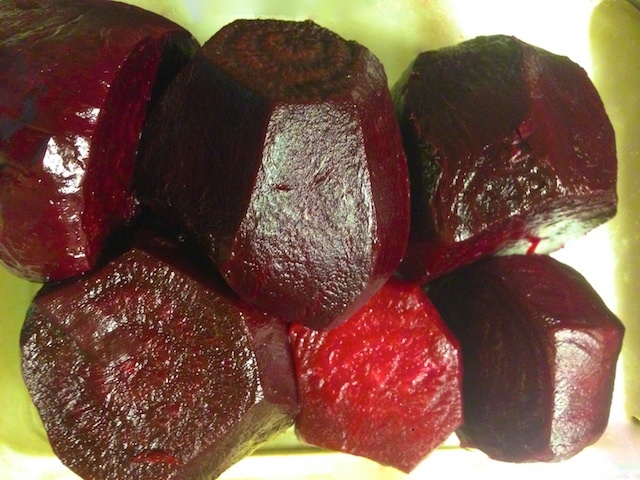 Scrub your beets to get the biggest chunks of dirt off. We are growing our own so must do this, but depending on where you buy yours, this may already be done for you. You will peel them after cooking, so won’t be eating that part anyway, so don’t fret about the dirt too much. 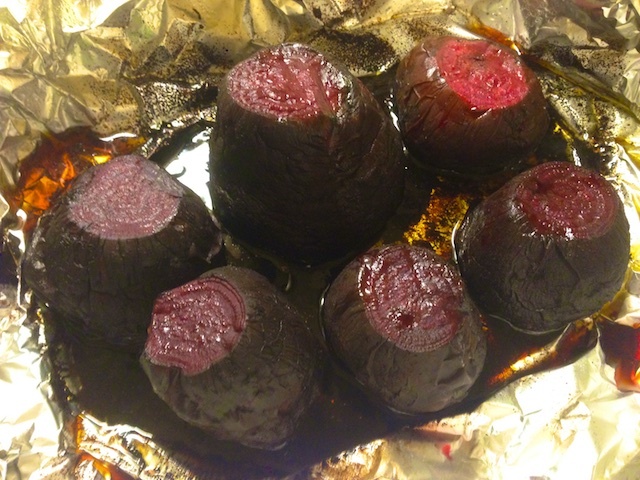 Cut off the top and bottom of your beets, and place them in a little puddle of olive oil in aluminum foil on a cookie sheet, pyrex pan, or roasting pan. 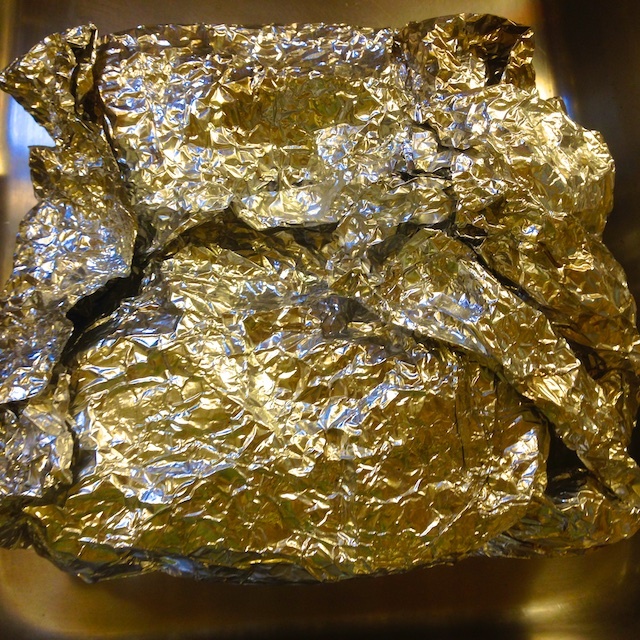 You will need enough foil to wrap them tightly closed. This way they will not dry out and you will be steaming them in that bit of oil inside the foil. Your house will smell fabulous. 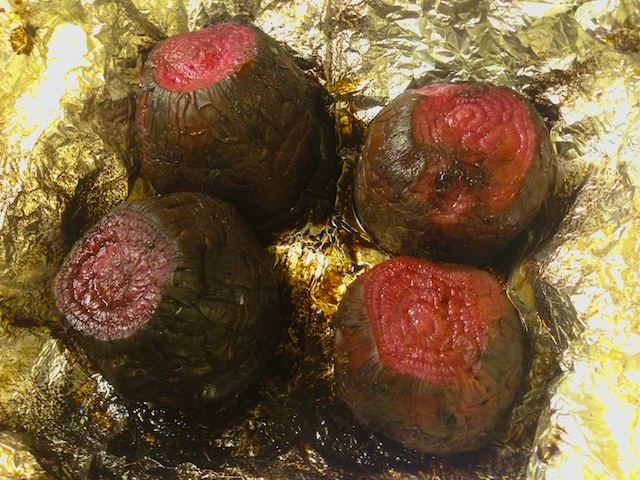 Take them out of the oven, leaving them to rest still in the tightly closed foil until cool. Sometimes I even do the next step the next day. 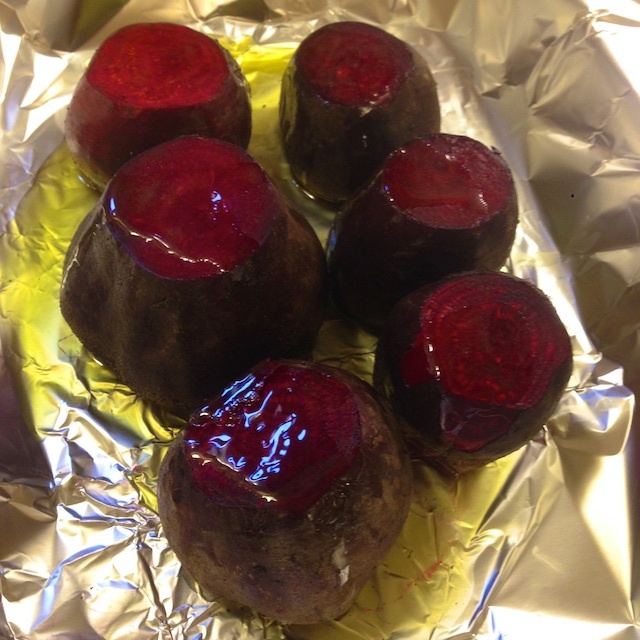 Take the cool beets out of the foil. They will now peel very easily. 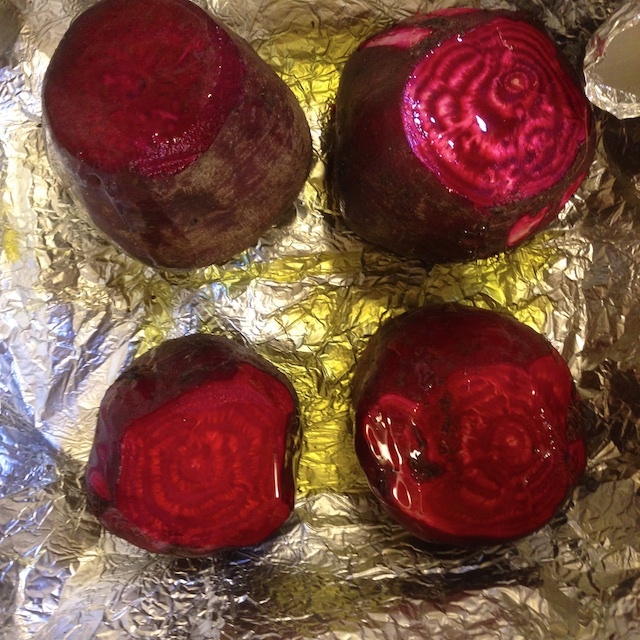 I recut the tops and bottoms to render a perfectly smooth, melt in your mouth beet, of consistent texture, with no crisp parts. 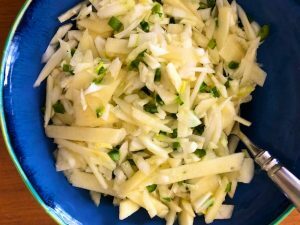 Once you’ve peeled and retrimmed them, I put them in a glass container in the refrigerator to use in recipes. 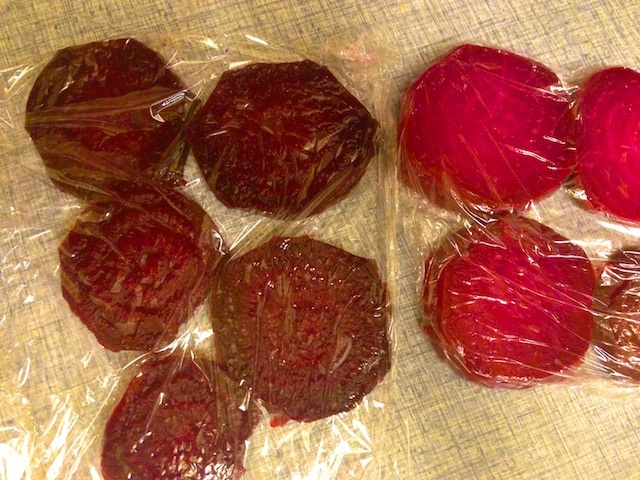 Or, if you have a ton of beets like we do, slice them, wrap them individually in plastic wrap, and freeze them in batches in ziplock freezer bags. They’ll be ready to go all winter long after thawing them whenever needed. Check out the photos of the process below. What to make with these succulent beauties? We like slices in sandwiches and on salads. 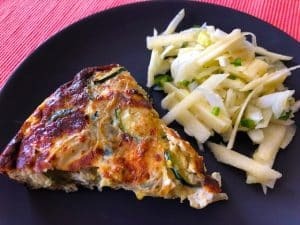 They are also good in frittatas. In the photo below you can see the beets we served simply with blueberries, cherry tomatoes, basil, and a little lemony vinaigrette. 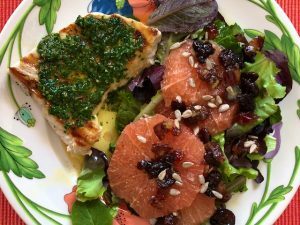 Try using roasted beets this season! What a welcome thing for us to have in abundance over here! That looks sooo delicious! I will absolutely try this! Never thought of roasting them. 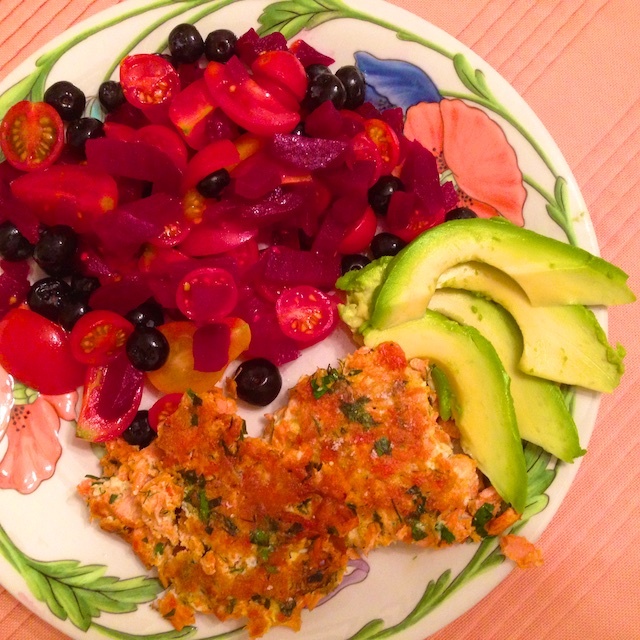 Now I’m hungry for sweet beets…! They look amazing. I planted lots this year but as soon as the leaves came up the rabbits chomped down on them. I transplanted them nearer to the house but they still came and ate them. 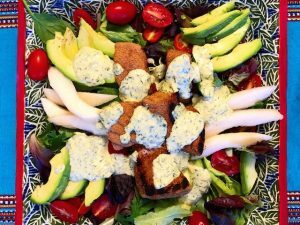 How about a blog about growing the fabulous food? 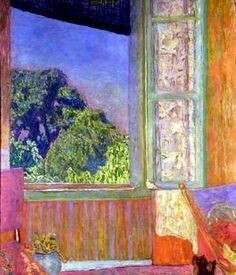 Did you have rabbit visitors? We don’t have rabbits, but do have ground hogs. 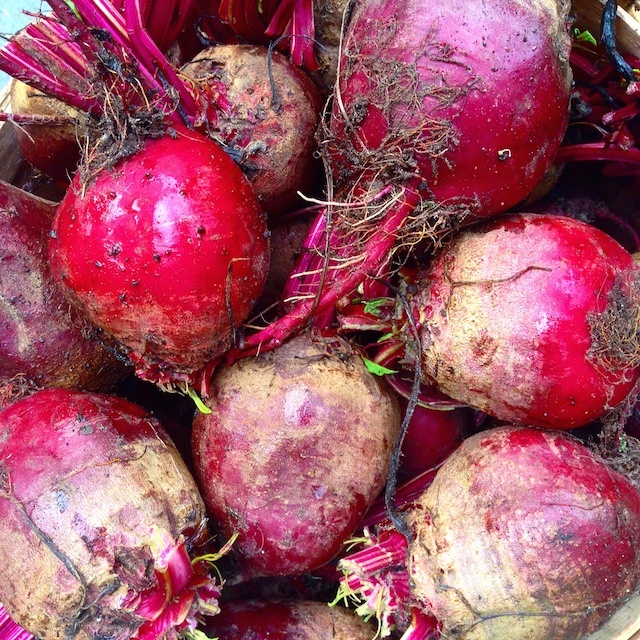 And something had taken chomps out of some of these beets underground. But we had so many that a lot came through unscathed. I did learn that if you plant them too close together they will be too small… Sorry you lost yours!